Author Kate Masur, reading from "An Example for All the Land: Emancipation and the Struggle for Equality in Washington, DC"
Today, Kate Masur, Assistant Professor of History at Northwestern University, read from her new book, An Example for All the Land: Emancipation and the Struggle for Equality in Washington, DC at the National Portrait Gallery (hat tip to the City Paper for letting us know about this event). 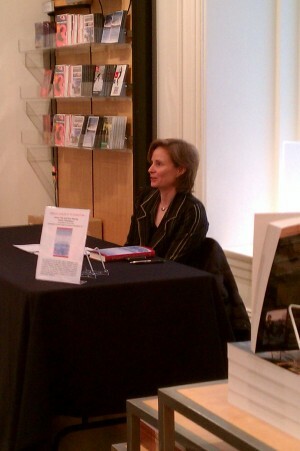 After the reading, Masur took questions from the standing-room-only crowd. As she quoted from the Reconstruction-era diary entry of a racist white Washingtonian, I was startled by how over a century later, similar sentiments could be found in the comments sections of local blogs and newspapers. Masur said she wanted to “illuminate the larger picture of dynamism in Washington” via the stories in her book. She also reflected on how once slavery was “resolved”, many local white Republicans cared more about business than equality. When Masur mentioned that An Example for All the Land –the first examination of Washington during Reconstruction in over five decades– explored why D.C. became a hub for black education and an African American middle class, the crowd buzzed with interest. Next week on DCentric: an interview with Professor Masur, and more about her book. Start your weekend off with free fun.